Fire makes very exciting shots, but making the right amount of flames behaving the way you want is often difficult to realize. 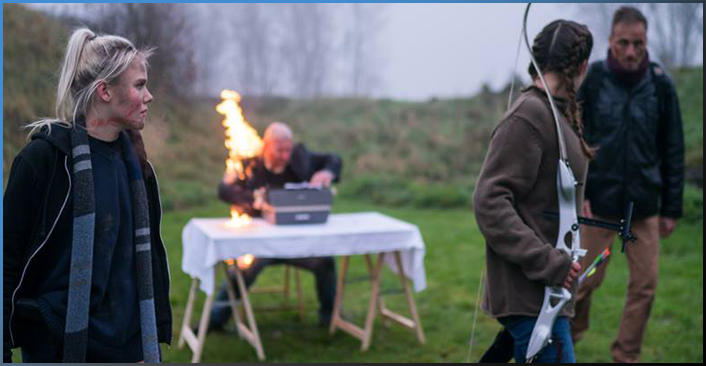 In the Netherlands we usually have to deal with wind and moisture on the set. To make the correct fire in those circumstances takes a specialist. And that's what you'll find at Dantes Stunts. You can also contact us for great realistic burning man or woman scenes. We work with the best materials from Hollywood to record your 'burning man scene' without any problems. Even burning the naked skin, the so-called 'naked burn' is no problem with us. As one of the few stuntteams in the world, we can burn the naked skin completely safe. Are you the first person to have a completely naked person burned in your movie? We are ready for it!